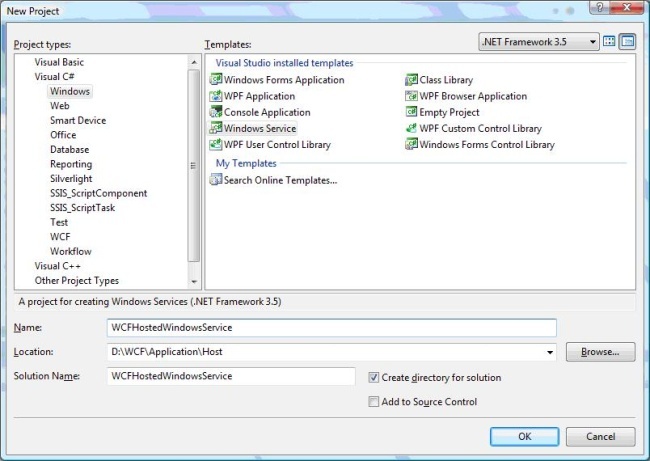 In this tutorial we are going to see the hosting WCF service in Windows service. We will use same set of code used for hosting the WCF service in Console application to this. This is same as hosting the service in IIS without message activated. There is some advantage of hosting service in Windows service. All versions of Windows will support hosting WCF service. 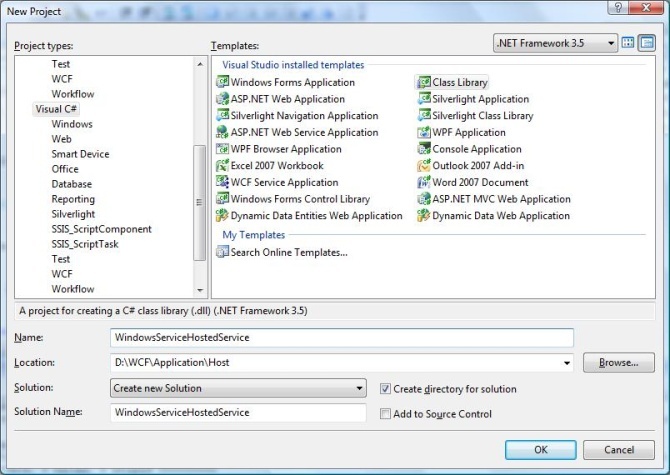 Step 1: Now let start create the WCF service, Open the Visual Studio 2008 and click New->Project and select Class Library from the template. Step 2: Add reference System.ServiceModel to the project. This is the core assembly used for creating the WCF service. Step 3: Next we can create the ISimpleCalulator interface as shown below. Add the Service and Operation Contract attribute as shown below. Step 4: Implement the ISimpleCalculator interface as shown below. Step 5: Build the Project and get the dll. Now we are ready with WCF service, now we are going to see how to host the WCF Service in Windows service. Note: In this project, I have mention that we are creating both Contract and Service(implementation) are in same project. It is always good practice if you have both in different project. Step 6: Open Visual Studio 2008 and Click New->Project and select Windows Service. Step 7: Add the 'WindowsServiceHostedService.dll' as reference to the project. This assembly will going to act as service. Step 8: OnStart method of the service, we can write the hosting code for WCF. We have to make sure that we are using only one service host object. On stop method you need to close the Service Host. 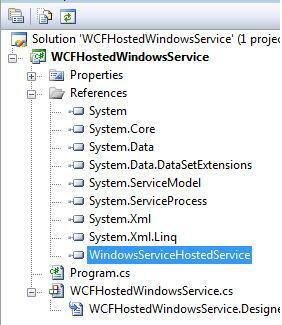 Following code show how to host WCF service in Windows service. Step 9: In order to install the service we need to have the Installer class for the Windows service. So add new Installer class to the project, which is inherited from the Installer class. Please find the below code for mentioning the Service name, StartUp type etc of the service. Step 10: Build the project, we will get the WCFHostedWindowsService.exe. 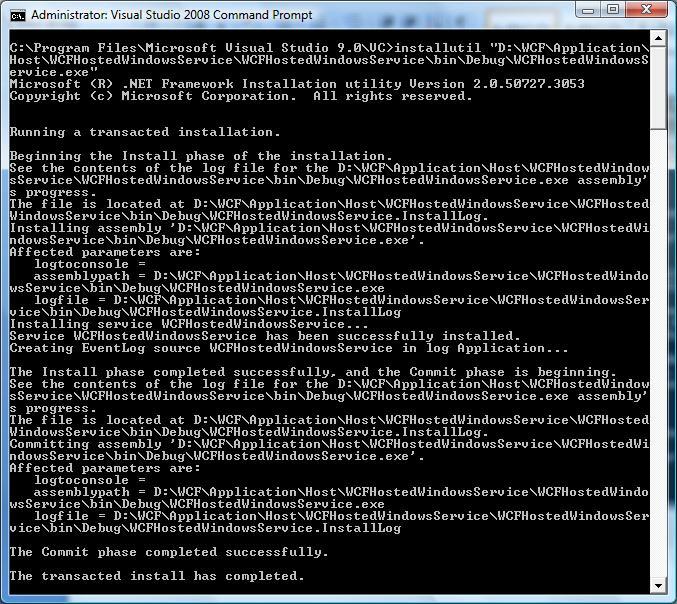 Next we need to install the service using Visual Studio Command Prompt. So open the command prompt by clicking Start->All Programs-> Microsoft Visual Studio 2008-> Visual Studio Tools-> Visual Studio Command Prompt Using installutil utility application, you can install the service as shown below. Step 11: Now service is Hosted sucessfully and we can create the proxy class for the service and start using in the client applcaiton.